Great post and information on commercial wine production in Kentucky and when it started. While doing research for my last blog post, I was inspired to share a relatively unknown fact about U.S. wine. One of the first states to begin commercial wine production was none other than (drum roll) Kentucky which started back in 1799. That isn’t to say wine wasn’t being produced in the U.S prior to this, for example, in California Jesuit missionaries started as early as the 1680’s but it wasn’t with the intention of exporting or mass distribution. Kentucky offered an ideal climate for wine-making in addition to the prevalence of limestone near the Ohio River. 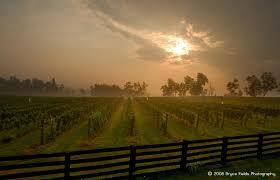 This combination led to Kentucky being America’s third largest producer of wine in the mid-nineteenth century. Liberty Hall located at 202 Wilkinson Street in Frankfort, Kentucky is a museum well worth your time to visit. Kentucky’s first United States Senator, John Brown, bought the property and historic site in downtown Frankfort in 1796. He began construction shortly afterwards on one of the earliest brick homes in this area. 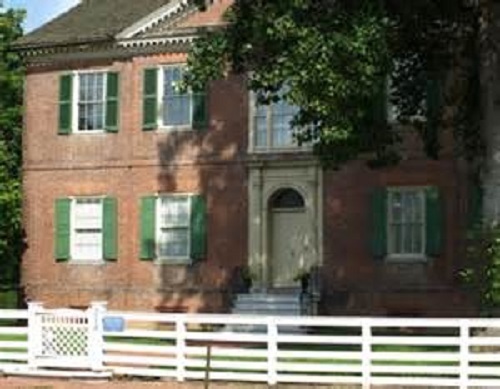 The house was completed in 1804. He named his home Liberty Hall. Liberty Hall, in addition to the main house, had several other structures including a kitchen, laundry, smokehouse, privy, stables, carriage house, slave quarters and a boat landing. The house was occupied by Brown and his descendants until the 1930s. It was opened as a museum in 1937. The Browns were very social people and hosted such dignitaries as President James Monroe, Col. Zachary Taylor, Col. Andrew Jackson, Gen. Lafayette, Aaron Burr, William Harrison and Theodore Roosevelt. The Grey Lady of Liberty Hall has haunted the grounds for many years. Margaret Vick, an aunt of Mrs. Brown, came to Liberty Hall when one of the Browns children died to be of comfort to the family. Margaret died of a heart attack in one of the bedrooms a few days after her arrival. She seems to appear throughout the mansion dressed in gray. Doors open and close, there are cold spots and strange lights. People have spotted her looking out an upstairs window. A curator took some pictures of a restoration project and in one picture there is an image of a woman coming down the stairs. A Spanish opera star disappeared from the grounds in 1805 while staying at the Browns. She was last seen walking near the river. Her body was never found. A dark-haired female ghost has been seen running through the grounds. A soldier appears peering into the living room window on occasion. Click for hours, tours, directions and more information. Click to follow on Facebook.